Mario Bandstand is a 4-player minigame that is found during the events of the Nintendo 64 game Mario Party. Three players play a tune on different instruments while another player conducts them. The player with the fewest mistakes wins. 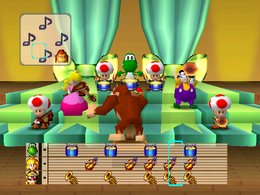 Mario Party 2 has a similar minigame called Toad Bandstand. The two minigames have names that are possible puns on the classic American variety television show American Bandstand. The audience are throwing shells and hammers at the curtain, when it opens up. One player has to conduct while the other players play their instruments. Players have to keep time to play the tune; if one of the players plays the instrument incorrectly, that player gets hit by a hammer from the audience. The player(s) with the most accurate timing of playing or conducting wins. At Mini-Game Island, the player always does the role of the conductor, and must do it perfectly without any mistakes in order to clear it. The minigame can be purchased from the Mini-Game House for 350 coins when it is available for a purchase. The conductor turns around and bows as the audience cheers. Coins are thrown at the winning player(s) as a spotlight shines on them. The curtain then closes. If the players did nothing, the audience doesn't cheer and the curtain simply closes. Game Rules – "Be a part of the bandstand! Conduct with Control Stick and play instruments with . Keep time to carry the tune." Advice – "An example is played first each time, so play in time as the cursor lines up with the marks on the sheet of music." One of the available melodies is Kaeru no Uta ("Song of the Frog"), a popular children's song in Japan. This page was last edited on August 28, 2018, at 10:32.